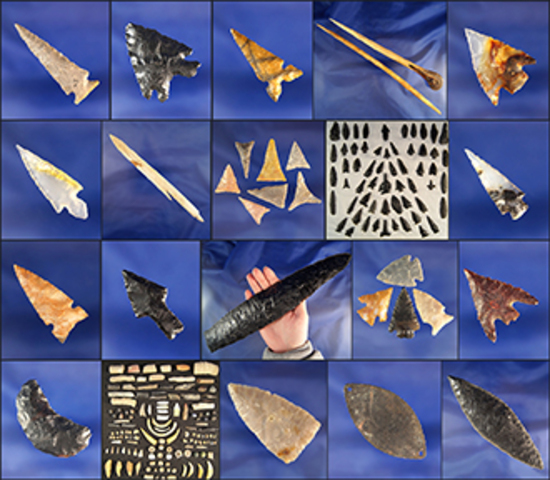 Indian Artifact Auction including a nice selection of Western U.S. arrowheads and artifacts. Gempoints, Columbia River, Great Basin & More. ALL GUARANTEED AUTHENTIC! 1 5/8" Scallorn point found in Texas that is very well flaked in excellent condition. 1 1/8" beautifully flaked Columbia Plateau found in Benton County Washington Ex. Mitchell. 1" Lewis River Short Stemmed found along the Columbia River. Ex. Vern Emil collection. Set of nine assorted arrowheads found in Washington and Oregon, largest is 1 3/16". Very nicely flaked 2 9/16" Obsidian Nightfire found in the Owens Valley area of east central CA. Very nicely flaked 2 9/16" Obsidian Nightfire from the collection of Charles and Blanche Home of big Pine, California. Found in the Owens Valley area of east central Cali...morefornia. Well styled 1 1/4" Klickitat Dagger found near the Columbia River by Kaye Don Bruce. 7/8" Gempoint with nice swept wings in excellent flaking found by Kaye Don Bruce, Washington. Nicely flaked 2" Plateau Pentagonal Knife found near the Columbia River. 1" brown Jasper Columbia Plateau found in the 1960s and the Oregon side of the Columbia River. 1 5/8" Elko Eared with an exceptionally well styled base found near Fort Rock Oregon. 1 7/16" Obsidian Elko Eared found near Fort Rock Oregon. 1 3/4" nicely styled Paleo Crescent found near Fort Rock Oregon. Group of 20 assorted artifacts found near Fort Rock Oregon, large basalt Knife is broken / glued. 7/8" Gempoint - highly translucent multicolored agate found near the Columbia River, WA. 15/16" nicely styled translucent Birdpoint found in the western U.S.
1 15/16" Obsidian Elko Eared found near Fort Rock, Oregon. Set of five Cascade points made from Obsidian found in Oregon. Largest is 2 11/16". Set of five delicately made Obsidian arrowheads found in Oregon and Northern California. Set of eight assorted Obsidian arrowheads, largest is 1 1/16". All found in Oregon. Set of four Obsidian arrowheads found in California largest is 1 5/16". 5 7/8" socketed bone harpoon tip found in Alaska. Ex. Favell museum. 1 1/8" translucent Obsidian Desert Delta found in Oregon that is very well flaked. Incredible material color pattern! 1 1/16" Toyah in perfect condition found in Texas.